GearWrench universal impact sockets feature manganese phosphate coating to resist corrosion, high visibility laser etched markings and secondary hard stamping. GearWrench universal impact sockets feature chrome molybdenum alloy steel (Cr-Mo) for exceptional strength and durability. The surface drive technology of a GearWrench universal Impact socket reduces fastener rounding. GearWrench universal Impact sockets meet or exceeds ASME B107.2. standards. The 84552D GearWrench 1/2'' Deep Impact Socket is one of thousands of quality tooling products available from MRO Tools. 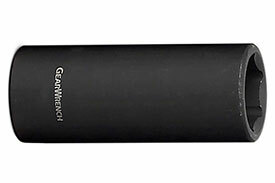 Please browse GearWrench 1/2'' Deep Impact Sockets for tools similar to the 84552D GearWrench 1/2'' Deep Impact Socket. 84552D GearWrench 1/2'' Deep Impact Socket description summary: GearWrench 1/2'' deep impact socket. Fastener Size: 3/4'' Point Size: 6 Point Drive End: 1.102'' Wrench End: 1.102'' Overall Length: 3.071'' Bolt Clearance: 0.531'' Wrench Depth: 0.358'' Length to Shoulder: 3.070'' Quantity discounts may be available for the 84552D GearWrench 1/2'' Deep Impact Socket. Please contact MRO Tools for details.